Limit how many checkboxes of a checkbox field may be selected at any given time. This plugin is part of the Gravity Perks package. Buy Gravity Perks today to get this perk plus 30 other galactic Gravity Forms plugins! When a limit is spanned across multiple checkbox fields, all checked checkboxes in those fields will count towards the specified limit. For example, if you have two checkbox fields with a shared limit of two (2), you will be able to select two checkboxes from a single field or one checkbox in each field. The minimum limit is validated when the form is submitted. If the user did not select enough checkboxes it will return a validation error with the minimum number of checkboxes that must be checked. How do I enable this functionality? Let’s start with setting a minimum and maximum limit on a single checkbox field. Create a new Gravity form or go to edit an existing Gravity form. 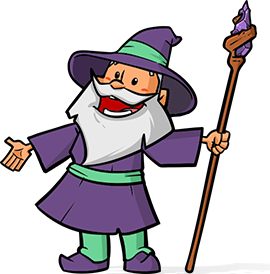 Create a new Checkbox field or open an existing Checkbox field to modify its settings. Navigate to the “Perks” tab (most often adjacent to the “Advanced” tab). Check the “Limit how many checkboxes can be checked” checkbox. Specify a minimum and/or maximum limit in the respective text input fields. If you would like to span a limit across multiple fields, follow the above instructions to set the base limits and then follow the below instructions to enable the spanned limit functionality and select which fields the limit should be spanned across. 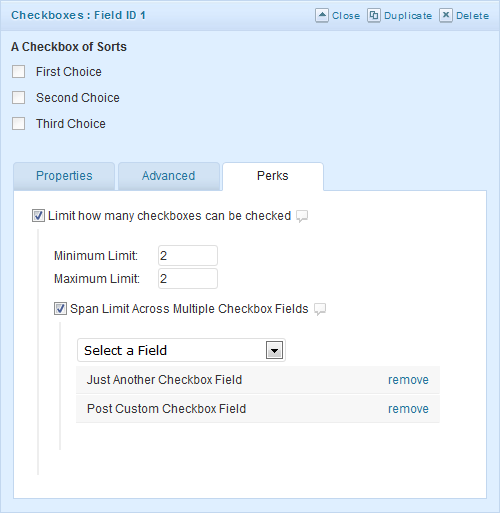 Check the “Span limit across multiple checkbox fields” checkbox. Select each field that should share the base limits specified for the current field from the drop down which appears after enabled the “Span limit across multiple checkbox fields’ option. Fixed conflict with Populate Anything where checkbox count was calculated incorrectly. Fixed another potential performance issue. Fixed a few performance issues when limiting a large number of checkbox fields. Added support for Gravity Forms 2.3 Select All feature. Select All will select up to maximum number of checkboxes. 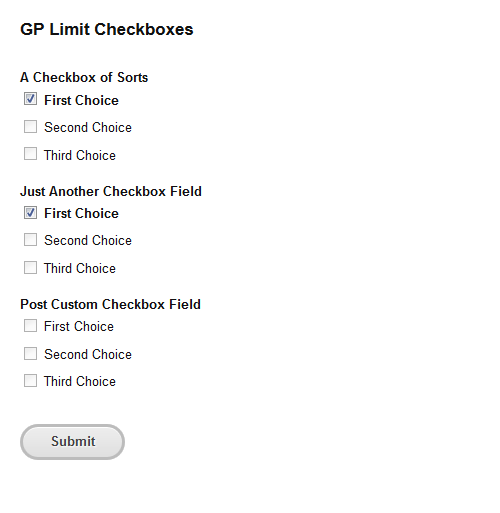 Renamed gwlimitcheckboxes.pot to gp-limit-checkboxes.pot to match the textdomain. Fixed issue where unchecking Span Limit setting did not clear field select. Added translation support and updated POT. Added ability to fetch GPLimitCheckboxes instance via window.GPLimitCheckboxes.instances[ formId ] for use in 3rd party integrations. Added 'gplc_group' filter (JS & PHP) to allow filtering the limit groups before they are processed on the frontend and before they are validated on submission. Fixed issue where checkboxes checked by default were not counted towards limits on frontend. Fixed issue where checkbox fields were incorrectly disabled if limit was enabled with no max limit specified. Fixed issue where min/max validations were processed even if no min/max limit was specified. Fixed issue where UI would flash briefly before being hidden when form editor was loading.